You Are Listening To "El Aranjuez"
The park, located in the beautiful Guadalupe Mountains, was created to preserve and protect Carlsbad Caverns as well as the myriad of other caves and caverns in the area. 550,000 people visit here every year. 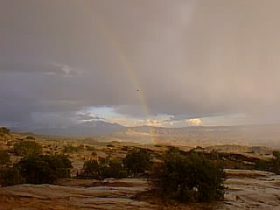 The desert seems almost gentle as it rises to meet the towering sheer rock face of El Capitan, standing 8,749 feet high. 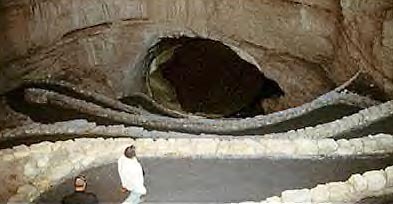 This is the original entrance to the caverns. 750 feet down is the main room. 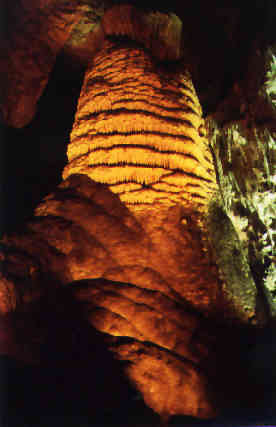 The series of caverns contains the nation's deepest limestone cave at 1,597 feet and the third longest cavern. This is the Big Room. It contains 14 acres with a ceiling 250 feet high. 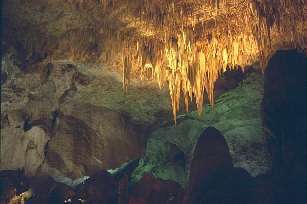 The caverns are roughly in the shape of a cross. In some places, you can look down into lower caves about 90 feet below. 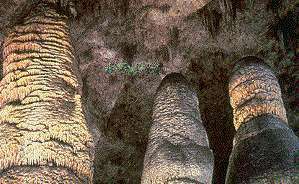 These huge stalagmites reach for the ceiling in the Hall of Giants. With the changing light, another giant creeps out of the dark. Each evening hundreds of thousands of Mexican free-tailed bats spill forth from a gigantic hole in the earth. This is the Bat Flight Experience. I don't know about you, but Joe is in the driver's seat and I don't think he wants to hang around for the bat flight. Where are we headed, Joe? On July 8, 1947, a press release issued by the Commander of the 509th Bomb Group in Roswell stated the wreckage of a crashed disk had been recovered. Hours later, that was rescinded and a new press release said the 509th had mistaken the wreckage of a weather balloon for a flying saucer. Hmmmm! Word spread that alien bodies were recovered from the wreckage. Glenn Dennis, a young mortician, spoke with a nurse at the local hospital who drew pictures of the bodies for him. She was transferred to England immediately after that and her whereabouts are unknown. Interesting. 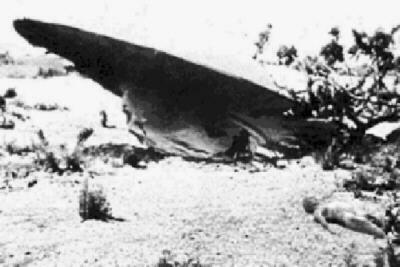 So what did crash in Roswell in 1947? 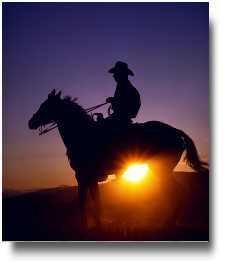 Well, it's time to keep moving on. 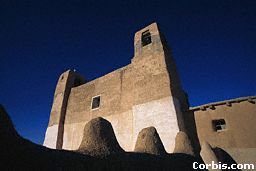 Alamogordo is a unique community of about 30,000 people. It is surrounded by the majestic Sacramento, San Andres and Organ Mountains, and is the home of Hollomon Air Force Base and White Sands Missile Range. This is the Space Center where the Astronaut Memorial Garden and the Air and Space Park are located. The IMAX theatre here has the world's largest projection system using 70mm film to cast a wrap-around image onto a 40 foot tilt dome and laser light show. 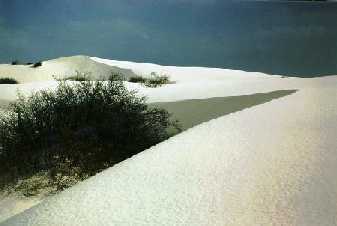 White Sands National Monument is at the northern end of the Chihuahuan desert and lies in the Tularosa Basin. Rising from the heart of the basin is one of the world's great natural wonders - the glistening white sands of New Mexico. Wave-like dunes of gypsum sand engulf 270 square miles. 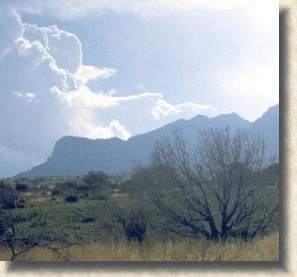 Lincoln National Forest is in the shadows of Sierra Blanca, the southernmost peak in the United States. The Forest surrounds the awesome mountain homeland of the Mescalero Apaches. I guess it's time to move along now. There are great things up ahead. Click on the license plate, and we'll see where the Chevy is taking us.